Painful spasms of the muscles. Symptoms and indications: The pain of a muscle cramp is intense, localized, and often debilitating. Coming on quickly, it may last for minutes and fade gradually. Contractures develop more slowly, over days or weeks, and may be permanent if untreated. Fasciculation may occur at rest or after muscle contraction and may last several minutes. Causes and risk factors: May be caused by low blood sugar levels, losses of sodium or calcium, dehydration or food poisoning, and alcohol abuse. Prevention: The likelihood of developing cramps may be reduced with regular exercise to build up energy reserves in the muscles. Avoiding exercising in extreme heat helps prevent heat cramps. Heat cramps can also be avoided by drinking plenty of water before and during exercise in extreme heat. Practicing proper body mechanics while sitting (sitting with both feet on the floor, back straight and legs uncrossed) can help prevent the development of leg cramps. Taking a warm bath before bedtime may increase circulation to the legs and reduce the incidence of nighttime leg cramps. The likelihood of developing cramps may be reduced by eating a well-balanced, healthy diet with appropriate levels of minerals. A registered dietitian can work with parents to identify a child's specific calorie needs and develop an individualized meal plan. 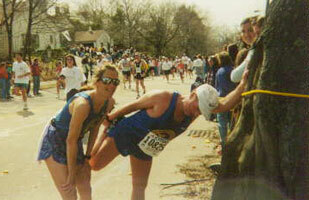 Fluids should be encouraged during all strenuous activities, especially in warm weather. People should aim for two to four eight-ounce glasses of fluid per hour of activity. If an underlying neurological disorder has been identified, dietary guidelines are individualized, based on the child's age, diagnosis, overall health, caloric and energy needs, and level of functioning. Early identification, treatment, and correction of specific feeding problems will improve the health and nutritional status of the patient.